A Justice League of America: Rebirth #1 Review – What’s Our Motivation? This book is a little confusing. Historically, when DC has put out an alternate Justice League title, the group typically has a distinct mission or commonality that separates it from the traditional League. For instance, Justice League Dark had an obvious paranormal theme. The 2012 Justice League of America book was about the team serving America’s interests. This new Justice League of America title is either about giving people “mortal” heroes they can relate to, or giving its team members a chance at a fresh start. Maybe both. The problem is neither of those concepts are sufficiently fleshed out to the point that they make sense. So there’s not enough there to get us invested in our heroes and make us care. After the events of Justice League vs. Suicide Squad, Batman has recruited former Squad members Killer Frost and Lobo to be part of a new incarnation of the Justice League. He also recruits Black Canary, Vixen, the Ray, and Ryan Choi (protege of the Atom, Ray Palmer). He sets the team up at the Justice League’s original base at Happy Harbor. That’s about it in terms of what this issue gives us. Granted, that’s assuming you haven’t read any of the character one-shots that have come out. But there’s no looming threat, villain, or indicator of what the plot might be going forward. We get a Geoff Johns style page at the end that previews stories to come, but it’s nothing specific. That’s not to say the first issue of every team book needs such things. But without them, this one feels flat. There are a few lines in this book about the new JLA not being “gods,” which presumably means they’re not as ultra-powerful as Superman, Wonder Woman, or the Flash. I like that idea. The problem is, this team doesn’t really fit with that M.O. In Justice League vs. Suicide Squad, Batman literally blew Lobo’s head off. He proceeded to grow it back. 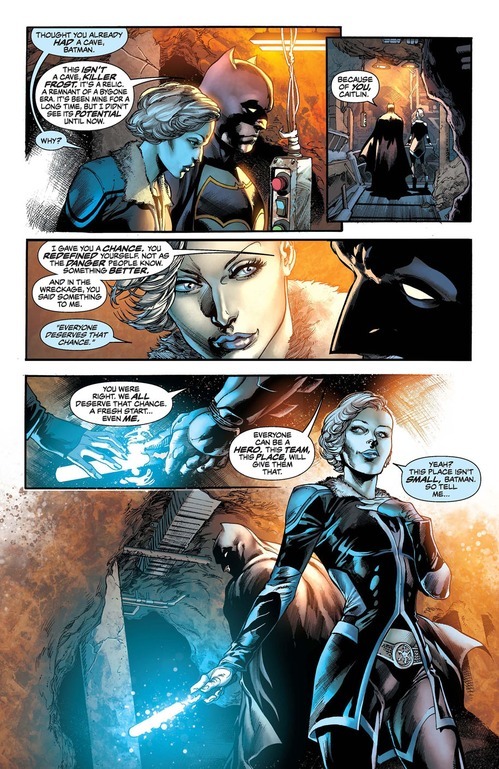 We also saw Killer Frost use her powers to incapacitate the League’s most powerful members. I’m not very familiar with this version of the Ray, but in the past he’s been virtually invincible. As for Vixen, we’ve seen her fly like a bird, harness the speed of a cheetah, and do any number of things that humans aren’t meant to do. So if the goal is to show people heroes that are “like them,” Batman and Ryan Choi are the only ones on this team who really belong. You can add Canary to the list if you’re a little more liberal about it. But most of these characters would be more than capable of holding their own against a Superman or Wonder Woman. Then there’s the whole second-chance/rebuild-yourself idea. I understand that approach with Lobo and Killer Frost. He’s a killer and she’s a villain. 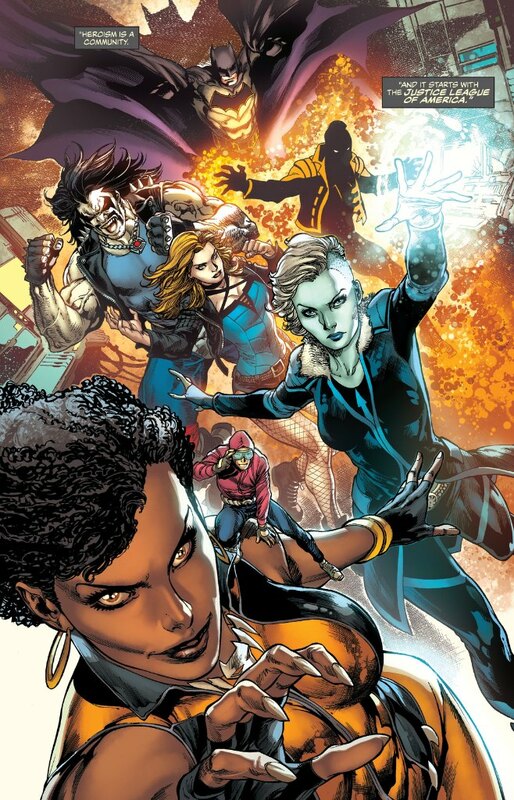 But Vixen wants more of an image rebranding than anything else.Black Canary is seemingly there just to help supervise. And why exactly do the Ray and Ryan Choi need a fresh start, anyway? In a first issue like this, there’s nothing wrong with strictly doing team-member introductions like this. But there’s a lack of consistency here that’s frustrating. These characters are all so different, which is a good thing. But when that’s the case, you usually need a strong commonality to justify putting them together. Justice League of America: Rebirth #1 doesn’t give us that. And without an intriguing enemy or opposing force, the premise of the series falls apart before it really begins. On the plus side, the use of the Secret Sanctuary, i.e. the “original” Justice League base in Happy Harbor is a great use of classic DC continuity. We get a nice full-page shot of the inside, showing us it hasn’t been used in some time. Batman calls it “a remnant of a bygone era.” I find that a little funny, considering when the New 52 started, superheroes had only been around for about five or six years. With this “Rebirth” initiative, the timeline is even more vague. So exactly how long ago was this bygone era? Ivan Reis is no stranger to the Justice League, and he’s always going to turn in quality work. He’s complimented wonderfully here by inkers Joe Prado and Oclair Albert, and colorist Marcelo Maolo. What I found particularly striking here was Reis’ rendering of Vixen. She’s very much the stunning supermodel the story calls for. But Reis also gives her a nice edge. She’s gorgeous, but also hardened. In certain panels you can see that wild, animalistic side lingering behind her eyes. Simply put, it’s one of the best takes on her I’ve ever seen. It’s just a shame it had to be in this book. Justice League of America: Rebirth #1 needed to hook us. It didn’t. We could have a great series coming our way. But JLA now has to work that much harder to win me back. Because as of now, I have no clue why I should be shelling out money to read it. 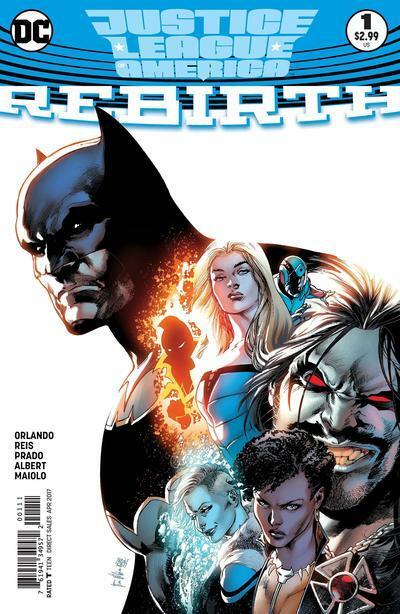 This entry was posted in Comic Books/Graphic Novels and tagged Batman, Black Canary, Caitlin Snow, comic book reviews, DC Comics, DC Rebirth, DC Universe Rebirth, Dinah Lance, Happy Harbor, Ivan Reis, Joe Prado, Justice League, Justice League of America, Justice League of America: Rebirth #1 (2017), Justice League vs. Suicide Squad, Killer Frost, Lobo, Marcello Maiolo, Oclair Albert, Rob Siebert, Ryan Choi, single issue reviews, Steve Orlando, The Atom, The Ray, Vixen (DC Comics) on 02/10/2017 by primaryignition.